mis•fit (noun): a person whose behavior or attitude sets them apart from others in an uncomfortably conspicuous way. Wonder what it’s like to work with a Misfit? 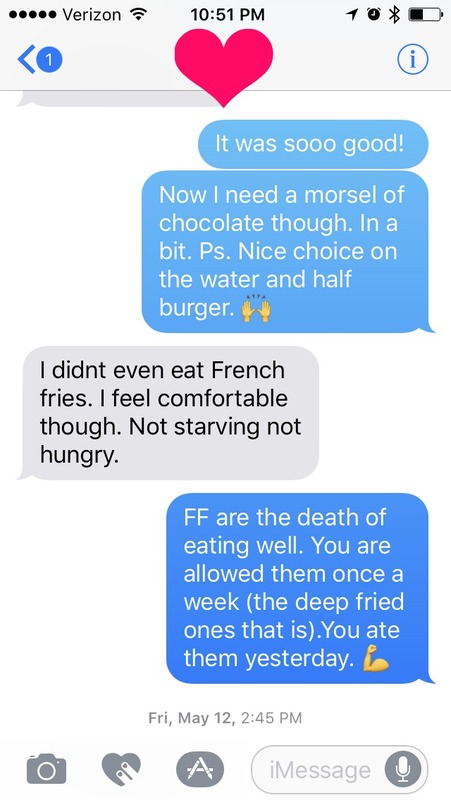 Here’s what a few text messages with a recent client look like. No more hiding in the closet. It’s time to be free of food shame and let loose! And A Tad More Love Below. I love Kim’s whacky sense of humor. She really kept me accountable and was able to pull me to the bright side when I wanted to hide in my closet and eat. She also never felt like I was a bother even though I was checking in every day. Bonus, I was able to make my goal weight even after working with Kim. I was able to find my own groove working with her and continue it on after. Knowing she’s always there as support though when things get rough is especially awesome. Kim completely over delivers in her wealth of knowledge. She gave me a specific plan of how to ramp up my sons nutrient needs for football in a very healthy, easy to follow plan. She even told me where to shop for the items at our local store. By explaining the science behind the suggestions, we were given the peace of mind knowing they came from sound experience and knowledge. 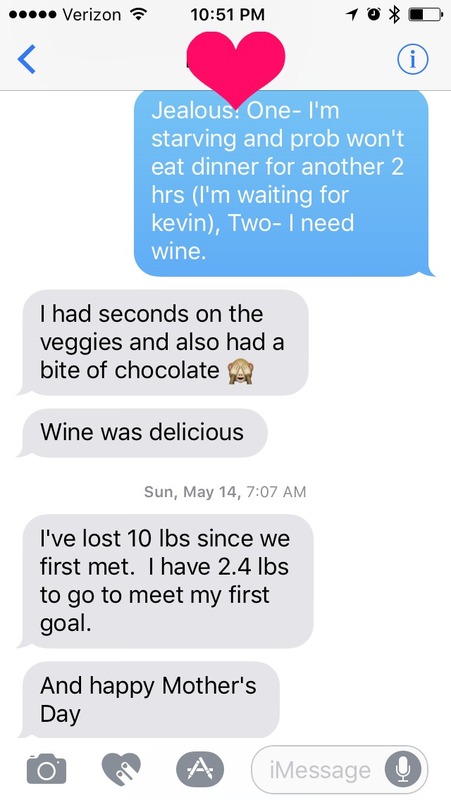 When I was struggling with outdated ideas about diet and nutrition, Kim came to the rescue! She was incredibly encouraging, took time out of her busy schedule both at home and at work to check in, provided encouragement and support, and shared her extensive knowledge of nutrition, wellness, and fitness. The “extras” she had me do – meditation, a short full-body exercise regimen, and a Vision Statement are very powerful and are things I continue to utilize in my quest to get and stay healthy. She was very easy to talk to, never made me feel silly or stupid, and helped me in areas that I struggled, such as how to plan ahead for a trip, how to deal with weekends that are less structured, and how to handle dining out to stay on track. I am very fortunate to have met Kim and look forward to our continued collaboration!! I love watching Kim in action. Whether it’s a truck driver, retiree or the busy, professional mom, Kim tunes into their wants and gives them easy to follow tips and foods to eat that leave the Patient feeling empowered and energized. No doom and gloom when working with this RD. 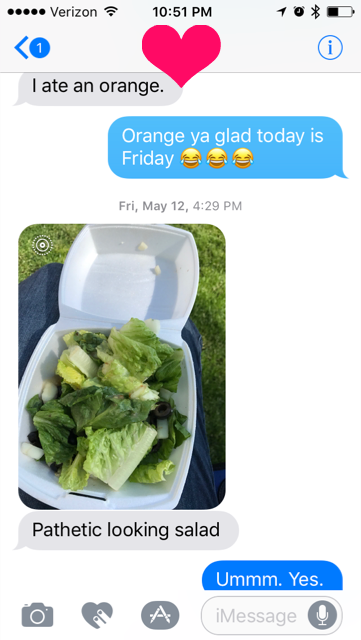 Amanda C.
Kim drew from her vast store of knowledge and experience to create a custom plan for my brother Joe who was on the verge of Type II Diabetes. It was easy to implement and delicious! Plus, she coached the whole family so we could support him in his efforts to lose a few pounds, greatly improving his odds of staying healthy. Joan W.
Still Have Questions? Perfect! Just zip me a message right here and I’ll get back to you! Please don't leave without snagging your quick read copy of 3 Easy Peasy Tricks you can do NOW to avoid the weight gain creep! 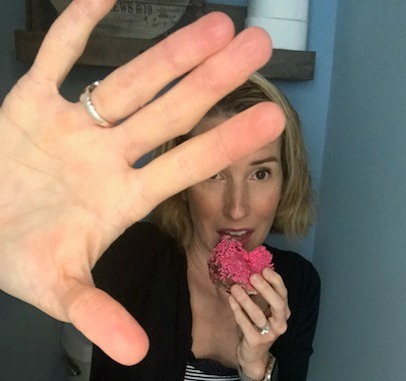 And yes, that's me eating a donut hiding in the bathroom. I promise I can be trusted. Sweet! Get ready for your confirmation email. Misfit Nutrition is spam free so no worries.